Passion. Long ago Melanie Allen learned that one must follow their passions because this is where true happiness and success lies – doing what you’re passionate about. Melanie has found her passion in teaching English, advising the school newspaper, The Rocket Reporter and serving as the Language Arts department chair and literacy coach at Moon Valley High School in Phoenix. Melanie truly believes that every student can learn, and is continually seeking opportunities that will allow for each student to learn and flourish. Throughout her seven years of teaching and advising she has continually sought out conferences or workshops that provide meaningful strategies to increase student learning. In 2006, she earned a journalism educator fellowship at UC Berkeley where she networked with 29 other journalism teachers from across the nation. While there she learned from leading journalism professionals about the industry and had hands-on training in reporting, editing, design, photo and graphics skills. She continually incorporates and implements these experiences throughout her teaching, working with other teachers and researching. Melanie serves on the board as president and fall convention coordinator, she previously held the position of vice-president. 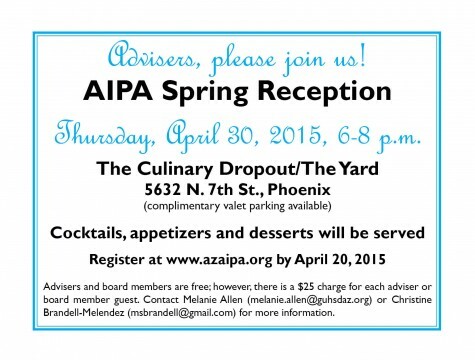 Her students enter the AIPA contests annually, taking away many accolades from each contest. This, along with her guidance, she feels, helps to empower her journalism students to tackle the issues that appeal to their readers. Moreover, many of her students have been accepted into various journalism schools such as the Walter Cronkite School of Journalism and Mass Communication at Arizona State University and Ball State University. Melanie graduated with her B.A. in Communications in 2001 and her M.Ed. in Secondary Education in 2005 both from Grand Canyon University.